Often compared to volcanoes, galaxies, and fireworks, Opals have a rich history due to their striking color pattern. Regarded to be the luckiest of gemstones because it can portray all colors, in Ancient Rome, this gem symbolized love and hope and was named "opalus," synonymous with "precious stone." Arabic legend says the stone descended to Earth from a foreign galaxy in a flurry of lightning and storm. When wearing this ring on your finger, you can't help but marvel at the unique, kaleidoscopic patterns and if you look close enough, you can even see a glimmer of the legendary faraway galaxies. The pendant features a 12.28 Ct Lightening Ridge Opal accented with 18/20 Karat Yellow Gold and Organic Silver. The beads composing the 20" chain are Natural Malachite and perfectly complement the lush, green tones of the Opal pendant. Malachite is considered to be a protection stone, absorbing negative energy and pollutants from the body and the surrounding environment. Hand Forged Silver Gemini Adjustable Cuff Bracelet. About 2.5 inches wide. The metal does not contain any additional alloys that could compromise the strength or quality of the piece. Each Organic Silver Cuff Bracelet takes about 8 hours to complete, ensuring that no detail is ignored. 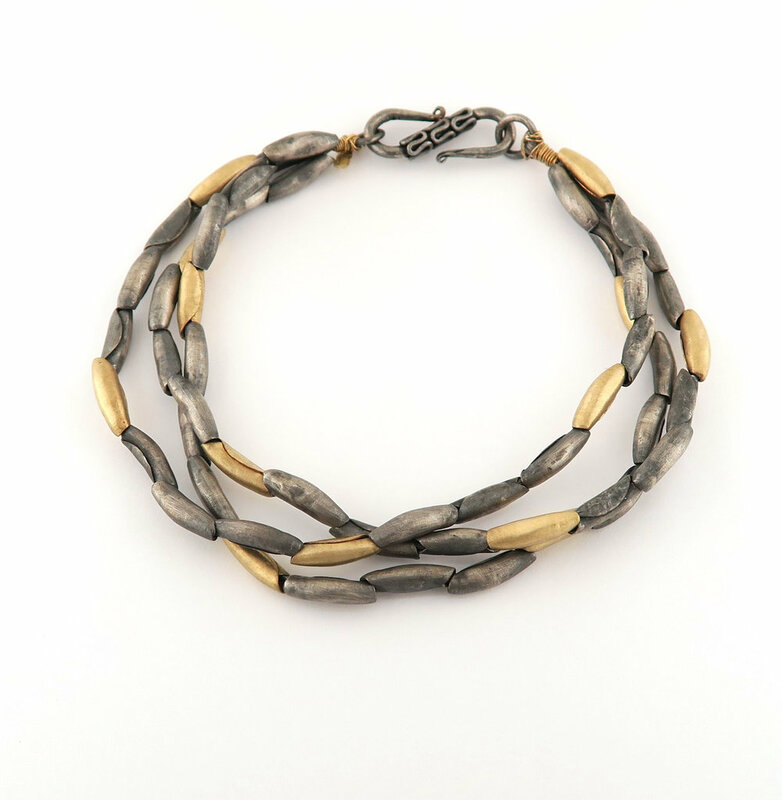 Due to the malleable nature of Organic Silver, this bracelet can be easily adjusted to fit small to large sized wrists, yielding a custom fit for its wearer.